As we all know, VMware vCloud Director is a widely adopted IaaS platform for the service provider market. 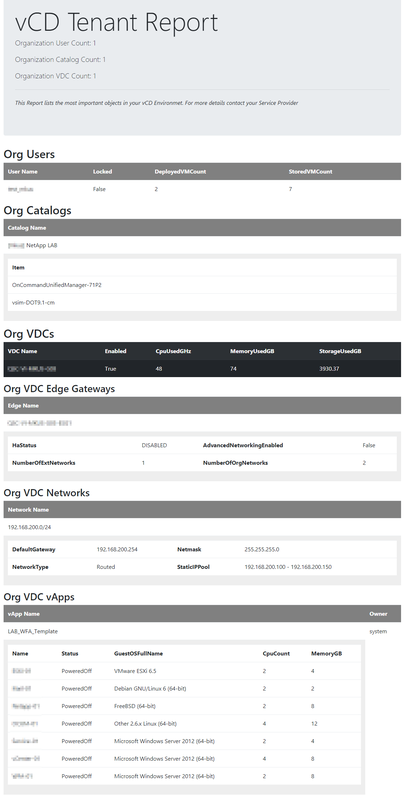 VMware vCloud Director offers a self-service web portal to manage your vApps, VMs, networks, and network functions (Edge Firewall, NAT, VPN, Load Balancer, DFW, and Rrouting). But there is also a RESTful API, and a PowerShell Module offered for the administrators and tenants. With the help of the API, some third– party vendors offer an extended web portal (for example, OnApp). In this article, I’ll show you how to use the VMware vCloud Director PowerShell Module (part of the famous VMware PowerCLI) to extend the default UI with a vCloud Director Tenant HTML Report for your most important objects. Unfortunately, there is no reporting option offered by the self-service web portal itself. The problem with extensive HTML reports created with PowerShell is that the ConvertTo-HTML Cmdlet is not really flexible. So I was looking for alternative ways and found the PowerShell module PowerStartHTML from Timothy Dewin. This module combines PowerShell with Bootstrap, a open source toolkit for developing with HTML, CSS, and JS. With this toolkit, I was able to create a report that contains the necessary information’s in a nice–looking format.